Promote highway safety by ordering a bumper sticker today - FREE! Interested in ordering more than nine stickers? Please use our large order form instead. Wanna do more than a bumper sticker? "I brake for migration" stickers remind motorists that migratory big game animals cross Wyoming's highways as well as our mountains and plains. 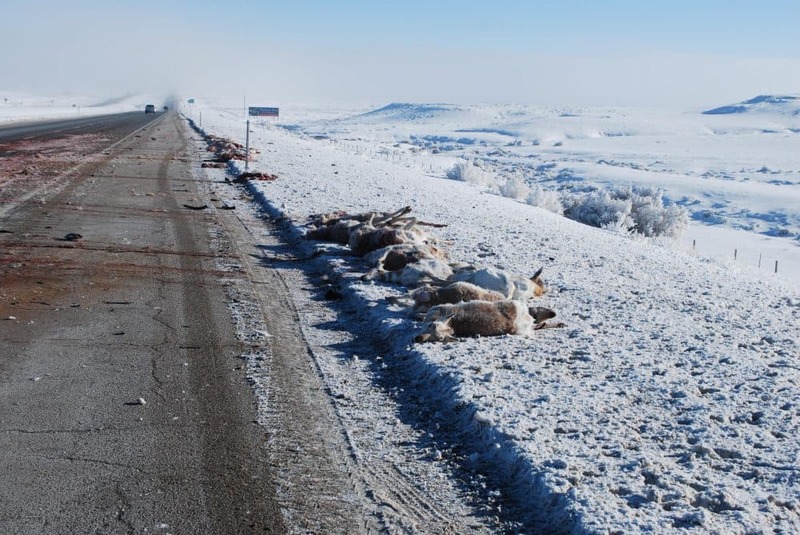 During this past winter, you may have seen photos of the high-profile accidents on I-80 and on U.S. Highway 26 south of Dubois that killed pronghorn and bighorn sheep. This is an ongoing challenge in Wyoming. By counting dibs on your sticker, you can help remind drivers to be mindful of slowing down for wildlife on the road. Not braking for wildlife can be deadly. The numbers are shocking: According to the Wyoming Department of Transportation (WYDOT), 12,197 car-wildlife collisions have occurred in the state in the last five years. In that timeframe, 17 people died from colliding with wildlife. To look at it another way, one of every 15 fatal car crashes in Wyoming in 2016 was related to hitting wildlife. The wildlife mortality count is considerable, too. In the past 5 years, WYDOT has removed more than 23,000 animal carcasses from state roads and highways. Indeed, according to annual statistics compiled by State Farm Insurance, Wyoming is among the top-ten states for frequency of wildlife collisions. We rank number eight, with every driver in the state having one in 85 odds of submitting an insurance claim related to hitting a big game animal. When we brake for migration, it can be a lifesaver. Research conducted by WMI, Wyoming Game and Fish, WYDOT, and many other collaborators has helped us better understand where and why these collisions are likely to occur, and how to avoid them. The principal thing drivers can do to avoid hitting a big game animal is to slow down. As we drive through the state, we can also be aware of when and where we are most likely to see wildlife on or near roads. In their release of the 2016 stats, State Farm notes that the months of highest collision rates are, in order, November, October, and December - i.e., during the autumn migration. Habitat can be a clue, too. WYDOT notes vehicle-wildlife collision hot spots occur in riparian zones. Because the state’s highways often follow streams and rivers, which can be valuable winter habitat for ungulates, these are areas to drive through with caution. State Farm’s data highlights the risk migratory ungulates face in using these valuable riparian areas for winter range and migration. We have also learned that there are numerous “pinch points” or bottlenecks where migrating wildlife are compelled to cross highways and interstates. WYDOT, Wyoming Game and Fish, WMI researchers and many other entities are collaborating to identify these bottlenecks. At a summit held in Pinedale this spring, managers met to discuss potential solutions, like installing or modifying underpasses and overpasses that allow migrating deer, pronghorn, and other animals, to avoid interacting with the roads at all. Lowered speed limits in these areas can also help drivers avoid hitting wildlife. So, next time you are in migration country (the whole of Wyoming), we hope you’ll use our sticker to remind fellow drivers to “brake for migration” and migratory ungulates. That way we’ll all have more time to spot Wyoming’s wildlife, while helping ensure there will be animals for future generations to enjoy.